"As a young teenager, I used to help my uncle with painting and decorating jobs," she recalls. "I then took a BSc Property Management at LSBU, where I really discovered my love of building surveying, and found myself really drawn to it as a career." 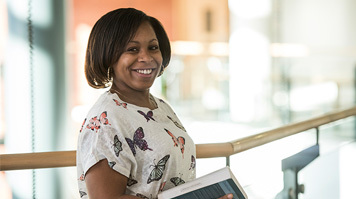 After graduating with a 2:1, Kavyne knew that she wanted to continue her education as she pursued his dream of a career in building surveying. "I already knew about the MSc Building Surveying at LSBU because I'd been studying in the same department," says Kavyne. "I had good relationships with the staff already, and the university has an impressive record with getting construction graduates into work. The location is ideal for me to, so it really was the natural choice." To help her to fund her postgraduate study, Kavyne applied for the Stuart A Johnson Scholarship. One scholarship is awarded each year, based on academic merit and the commitment of students to their future career, and the current value of the scholarship is £4,000. It's available to students on MSc Building Surveying, MSc Construction Project Management or MSC Quantity Surveying. Kavyne was delighted to discover that she had been selected as the successful candidate by the scholarship board. "I was a combination of many things," she recalls. "I was relieved, excited, shocked, overwhelmed and nervous all at once! I wasn't sure if I would be successful because even though the application process was straightforward, I found it difficult to explain just how important the scholarship would be to my career and development." Kavyne's scholarship is already providing her with valuable help. "Being able to study on a course accredited by the Royal Institution of Chartered Surveyors (RICS) means I am on the right road to becoming a Chartered Building Surveyor," she says. "Without the scholarship, I don't think I would have been able to complete the course." Kavyne is keen that other students realise the impact that scholarships can have on their studies, and hopes to encourage more people to apply. "Many people are put off postgraduate study because they think the only way to fund themselves through it is a personal loan. In fact, there are lots of other ways you can fund your studies, and I would urge anyone considering postgraduate study to look into them."